Middle school readers will love the Alcatraz series, of which Alcatraz Versus the Evil Librarians is the first title, originally published in 2007 and rereleased in 2016. Along the lines of the Lemony Snicket series, there is a lot of narrative snarkiness and an attempt at metatextuality, which unfortunately falls short. The best feature of this book is its plot, which sadly gets mired down with the forced jokes and a lot of “look at me” moments with the main character breaking the fourth wall. Al, short for Alcatraz, is similar to Harry Potter: an abandoned thirteen year old repeatedly told by adults he is unwanted and un-loveable. He is made to endure crappy birthdays. He suddenly discovers he has a strange talent (breaking things), and there is a whole different world now open to him. Good thing because his foster parent wants him out of the house. Soon Al’s grandfather shows up a la Hagrid, and explanations about Al’s birthright ensue, along with the plot of the dastardly librarians who are trying to take over the world by spreading misinformation. Despite the similarities here, Al and the misfit cast of characters with strange and antihero-like talents, such as tripping, are delightfully different. There is an important emphasis on the power of knowledge and information, but it is unfortunate that the librarians, albeit tongue-in-cheek, are the evil-doers. On his 13th birthday Al inherits a bag of sand from his parents. Depressed, Al celebrates his birthday with comfort food only to accidentally set the kitchen drapes on fire, using his “talent.” His grandfather’s was to arrive late to things. Ultimately Al’s talent saves his life and puts him on to a course of unexpected adventures. Al writes this title first in his so-called autobiographical series in order to enlighten those who worship him in his home world, explain his exploits, and prove he is an average guy—in fact, that he is a less than average guy: a coward. When the book opens, Al is tied to a sacrificial altar made of outdated encyclopedias. Sanderson tries too hard to force the funny and falls short on plot and character in an attempt to be clever with Al’s many asides. 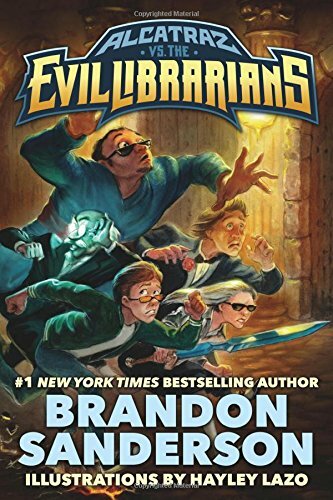 Filled with slapstick humor and sarcasm, Alcatraz Versus the Evil Librarians’ young readers will find a new favorite series after Rick Riordan’s Percy Jackson series. This is a quick and easy read with occasional illustrations. Readers may be hooked enough to try the second book in Sanderson’s series, but hopefully by then he will have found an editor confident enough to insist on tighter prose and a snappier pace for the narration, cutting back on the hammy moments, making Alcatraz Versus the Evil Librarians the unique and fantastic read it’s meant to be.